one task to the next. Lyriq Bent has been moving about as well, quietly, thoughtfully, not caught up in the fray but making his way between interviews with focus and intentionality. The strikingly beautiful Ellis is clearly fighting a cold, but doesn’t mention it as she takes her seat for the interview. With his rugged good looks and sophisticated demeanor, Bent speaks to Ellis gently, making sure that she’s okay. Carolina, Massachusetts, Canada and Sierra Leone. Lyriq Bent plays the character of Chekura Tiano, a young boy who helps in kidnapping Aminata and becomes her true love after also being sold into slavery by her captors. Aminata becomes the author of the real-life “Book of Negroes,” a historical document compiled in 1783 by order of the British military, which listed the names of 3,000 blacks who during the war had served the King of England against the colonists. Based on their service, they were allowed to move to Canada where they could live as free people instead of being returned to slave owners in the Southern states or living a precarious existence in Northern states. 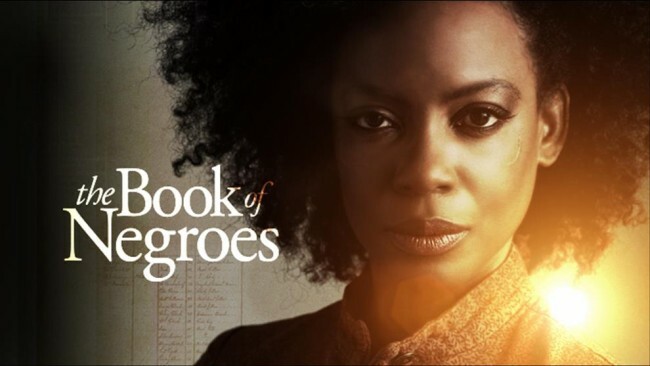 Aunjanue Ellis and Lyriq Bent star in BET’s miniseries ‘The Book of Negroes’. is on full display in the interview. It is apparent that not only is this miniseries unlike any other that has come before it, but these actors are also distinct in their affinity for the material and the characters that they to bring to life. When asked where Aminata falls in the trajectory of dynamic black women characters on screen today, Ellis simply answers that she doesn’t. “I think she’s singular. I think she stands on her own. She’s very much an individual. And I think that’s what people are going to relate to — that she’s unlike anybody that we’ve seen in a very, very long time,” says Ellis. Aminata is a character that stands alone not only because of her characterization but also because the story is told through her lens. “A lot of times the stories about the struggle for freedom are told from the male perspective, and this is very much a woman’s story,” adds Ellis. Aminata’s story is an important one that includes the journeys of Chekura (Bent) and Sam Fraunces (Cuba Gooding, Jr.), two very, different men who play major roles in the various stages of Aminata’s life. Bent, who is a Canadian of Jamaican descent, understands Chekura’s complex identity and worked diligently with Ellis and the film’s writer/director Clement Virgo to bring out Chekura’s willful yet subtle emotional side. Bent was able to really connect with Virgo, who is also Jamaican and Canadian on showing the many emotional layers of Chekura’s character. “As Jamaicans we’re very resilient and strong willed people. Working with Clement was a great opportunity to exercise those two things,” says Bent. “Clement is a visual person and I was able to connect with that vision to create these beautiful images of Black people so that we could tell Chekura and Aminata’s story,” adds Bent. 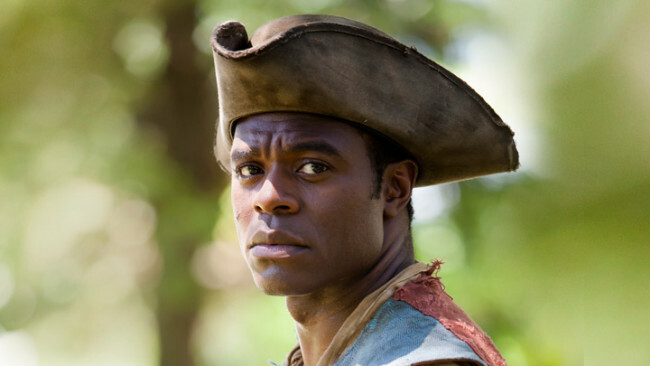 Lyriq Bent stars as Chekura Tiano in BET’s miniseries ‘The Book of Negroes’. 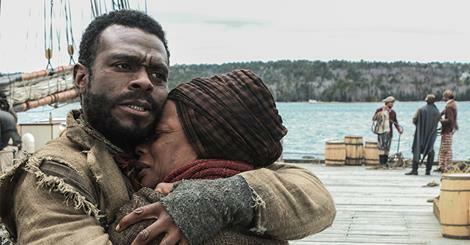 The Book of Negroes is more than a story about a singular woman’s journey. It is also a love story – the depths and resiliency of black love at a time when all odds were against you as a black person in the new world. The onscreen chemistry between the actors is undeniable. “Lyric was a very generous acting partner. We would come to set and we would do scenes and it would be rehearsal and it felt like we were just talking, you know. It just felt like we were just talking. And the setting just happened to be, in the 18th Century in some shack somewhere,” said Ellis. “It just felt easy, you know.” Bent underscores Ellis’ sentiments. “The moment I walked into the room and I saw her it just felt organic to me. It just felt very natural. In my mind I was like done. That’s how I felt from day one. And I just wanted to maintain that type of, you know, organic growth with Aunjanue,” says Bent. The ease with which Bent describes their working relationship conveys the onscreen closeness. “Sometimes you work with people and you just don’t want to even be in their space but you do it because it’s your job, you know. This was a very organic thing that I embraced, which is scary, in and of itself, because you don’t know why you connect with somebody. And then you go on this emotional journey with them. And, yeah, from there it was just like no turning back,” adds Bent. Love is a major part of Aminata’s journey. Like the subject matter, the love story between Chekura and Aminata is also something rarely seen on television. Ellis and Bent are stars in their own right, but their outstanding lead performances in The Book of Negroes is sure to take them to higher heights. Audiences will fall more in love with them as actors as they travel with their characters along a journey that is truly about life, liberty, love and the pursuit of happiness. The Book of Negroes premieres on BET on Feb. 16-18, 8p.m. EST. Check your local listings for channel information. This article was written by Nsenga K. Burton, Ph.D., founder & editor-in-chief of the award-winning news site The Burton Wire. Follow her on Twitter @Ntellectual.